This is a functional top loading washing machine with a 3.5 cu ft capacity, which means that it can wash up to 18 bath towels in a single load. The machine is designed to reduce the impact on the environment, saving 32% on water and 48% on energy consumption (based on using the normal cycle and compared to a conventional machine built before 2004). The machine comes with the SMART CARETM function, so that based on the selected soil level it is able to automatically determine both the cycle time and wash temperature. The Kenmore 700 is designed for reliability and long life, having a white porcelain wash basket that is intended to resist scratches and minimize odors. The SMART CARE function can be overridden, allowing the user to choose how much water to use and the temperature of the wash – there are five different settings for each. Noise is often a problem with washers and while this one is not silent, it has good balance and anti-vibration features which keep the volume down. The washer has a security feature which prevents the lid from being opened when the wash cycle is in progress. It is available in either white or blue, and there is a matching Kenmore 700 dryer - they are a popular combination. This machine is more energy and water efficient than its predecessors, but is certainly not one of the most efficient on the market. However, it is a tried and tested design. The control panel is not as user-friendly as it could be and takes some getting used to, and some users find the neck of the tub a little small and have difficulty getting bulky items in and out. The Kenmore 700 is a very popular washing machine, and another reliable member of the Kenmore stable of appliances. There are plenty of satisfied users out there who have found it toe be a reasonably priced solution. Works like a washer should. I have read the comments on here and ...am surprised by all the negative feedback. I had the option of getting whatever washer I wanted ...and choose this machine for good reason. One, you can SOAK clothes in it! Try doing that in a spit and wash front loader. You can't. I have had my washer for almost five years. It acts like new and looks like new. I have NEVER had a problem with it. It balances well...but mostly it washes clothes and gets them CLEAN. This washer is a joke. Mine is 5 yrs old and it started leaking...took it a part and not only did the drain hose have a hole in it from rubbing, the tub also has a hair line crack in it. We are 2 people living in this household. Of course it is out of warranty and Sears wants to do nothing for me except sell me a new washer. 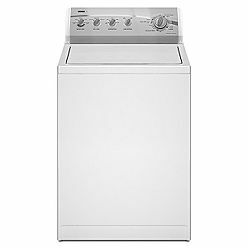 I own the Kenmore 700 series top load washer and dryer. I am very unhappy with the washer because the lid and top part has a covering on it that appears to be plastic which is peeling away. The top is not porcelain and very poorly made. I contacted the Sears store and also the manufacturer and they were no help whatsoever. The manufacturer commented that this had not been a problem with this particular washer but that is untrue. I have read reviews and others have had this same issue. I will not be buying another Kenmore washer. The quality has dropped significantly.Years ago I had a Kenmore washer and dryer that lasted over 17 years with no problmes at all. Not the case anymore. This KENMORE WASHER is HORRIBLE. I have only owned for four years and mine has been making loud noise during spin cycle for two of the four years. The inside tub is metal, however, top of it is not and the plastic is coming apart and a joke everytime I wash I get pieces of the plastic in my laundry. I have owned Kenmore washers all my life and this is the worst one ever! DONT BUY IT! Okay to start but now it's junk. Bought new and to start it was just okay. It doesn't hold near what it claims of 18 towels. bahaha, that's a joke. It did handle some large loads but those came out not nearly as clean. However 2 years later it just broke. It fills with water, hums, stops. I can't get to wash/agitate and drain. It refuses to drain and so my clothes at the moment are sitting in a tub of water. I'm off to buy a new washer and NOT Kenmore tomorrow. I had a Kitchaid washer that lasted 9 years, this one bought June 2009 and broke October 2011. Why can't manufacture's make a product to last? If they think they are insuring a more sales by necessitating the need more frequently, well all they are doing is killing customer loyalty. 2 years is not a quality product. Hooked up washer and it would not fill with water. Called the technical person at Sears and was informed that clothes had to be loaded in washer so the sensor would kick on to fill the waser with water. I think this is absurd since older models would automatically fill based on what size load was selected. Too much new technology to suit me. I have had this washer for 2 years. I have had some problems with vibration and rinse cycle. Was under a maint. contract and was fixed. Recently it developed a new problem (leaking) not under contract anymore ofcourse,but had repair man come check it out and the drain hose had a hole in it from rubbing (Vibration) against the metal washer frame. The cost was $350 with parts and labor. I Bought a new washer and it wasn't a KENMORE! I have been a Kenmore fan for a long time,but after purchasing washer,dryer,range and microwave..they all have problem! I've had this washer for 2 years. The water temperature adjustment goes crazy at times, so I always have to stay while the washer is filling (sometimes I have to turn it on "hot" to get "cold" water), but the biggest problem is that when it does this, it rinses my clothes in "hot" water! There is nothing I can do, except to start the cycle over, so that I can control the water temperature. A year ago I had a repairman come out; he said the hoses were hooked up incorrectly, and he put in a new part. But it's happening again, so I don't think it was the hoses. I think I'm going to have to buy a new washer. I'm also not happy that my 6 year old Kenmore dishwasher has to be replaced. The motor died and would cost over $400 to replace, so I'm buying a new one. It was only run every 2-3 days since it's only my husband and I at home now. That means really only 2-3 years of regular use. I loved how the dishwasher loaded, but now I'm not a supporter of the Kenmore brand. I bought the 700 series washer and dryer brand new a year and 4 months ago. The spin cycle stopped spinning so the clothes come out soaking wet. Repair man told me it would cost around 300.00 to fix...not worth it. I also bought a new Kenmore refrigerator at the same time and the ice maker quit working......more junk. I will not be purchasing anymore SEARS Kenmore products in the future. My parents purchased this washer a year ago. They wanted a traditional top loading machine that was simple to use. It is simple, but has some performance issues. The clothes come out soaking wet and must go through the dryer twice in order to get them dry. The option of warm water means that it puts in hot and then adds cold so if you don't want your clothes to shrink, you better just use cold. There are several other water temperature options, but my parents have learned they all start with hot water so they don't use them. In other words, there aren't really all the options - just hot or cold. Had this dryer for 36 years. It just died. Way to go Kenmore! When you cannot see the agitation since it will not move if the cover is open? Anyway, I still love my Kenmore 700 washer. I love my Kenmore! This is the best washer I have ever owned! I bought it about 2 years ago from Sears. I was really impressed with the heavy duty large capacity of the tub. I have two kids so I need a large washer! It is so big inside and that is so helpful to reduce the number of loads I have to wash.
Also, the "Agitator" mechanism is somewhat unique. It agitates in two directions at the same time which really helps get stains out of clothes. We have put that agitator to the test in this house! I also love that it has separate bleach and fabric softener dispensers - something my old machine did not have. Our old machine did the job, but since I have had this new washer I have realized just how much cleaner my clothes feel and how many fewer washes I can do in one day. This new machine is also more water efficient than our old machine. Many of the new washers we looked at have the modern push button, computer- like buttons. I really wanted to stay away from those kinds of controls because my friend has had 2 washers with those kinds of buttons and the buttons routinely broke. I was really happy that we were able to buy our washer with all of it's modern conveniences, yet we were still able to get the old fashioned twist knobs. Our new washer also has the option of a double rinse cycle and also a heavy soil option, both of which are very helpful after we've come home form the beach with sand in our towels. The Kenmore washing machine is a machine of excellent quality at an affordable price. I paid just under $500 CAD for this washing machine and don’t regret it for a minute. This model has all of the features I require for me basic everyday laundering needs. It has a temperature control for the water, a second rinse option, the water fill level option to save water, regular or soiled clothing option, as well as different cleaning settings depending on what you are washing. I usually only use the normal setting option as everyday clothing and towels tend to be the only things I wash.
My clothing is always clean when it comes out of the washer and unlike some washing machines I’ve own in the past, my clothes are never ripped or shredded when they come out of this washer. My only complaint is that this washer is very noisy when it spins. It is usually not balanced or level and doesn’t seem to matter how many times you adjust it or move the clothes around in the washer, it always bounces and creates a racket.